In the Book of Mosiah, we are introduced to the great King Benjamin. His story starts near the end of his life. He gathers his people to anoint his son Mosiah to be king and to provide those whom he loved and served for so long with his parting testimony. However, prior to King Benjamin’s address was almost 400 years of Nephite history. During these four centuries the Nephites came perilously close to being annihilated. I bring this up because I feel we can better understand what King Benjamin says in his farewell address by looking backwards to see how the Nephites came to the Land of Zarahemla. Not long after the deaths of the original settlers, (Lehi, Nephi, and Jacob), the Nephites began to drift. This makes sense. The first few decades after their arrival the main focus was survival. They were in a new land with a new climate, new wildlife, and new diseases. Plus, they had an enemy focused on their destruction. In the early years, there were battles between the Nephites and Lamanites, but my guess is that after these heightened emotions cooled, both peoples focused more on taming the land and less on fighting each other. So, as generations came and went, they started to focus less on survival and more on personal gain. In time, the Nephites forgot the Lord. Their central focus was enjoying bounty of the land. They had the natural desire to rejoice in what they felt they had accomplished. As a result, greed replaced selflessness and people judged each other on what they had accumulated. Not surprisingly, the Nephites suffered many wars and around the year 130 BCE, the Nephite nation was on the brink of extinction. 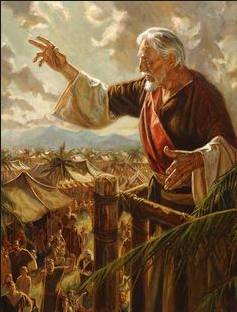 Luckily, the first King Mosiah was a righteous man and was warned in a dream to leave the land a Nephi. This was a cultural reboot for the Nephite nation. Now they had to start from scratch. All they had was the clothes on their backs and the sacred records — reminiscent of Lehi and his family. Eventually, they came to the Land of Zarahemla where the merged with the Muelekites and slowly reestablished the good parts of their former culture. So, King Benjamin saw the Nephite nation rise from the ashes of destruction to once again become a righteous people. But he could see a disturbing trend reemerging. Once again, the people were becoming comfortable and were slowly drifting away from God. As we look more closely at the themes of King Benjamin’s address, we will see clear signs of this spiritual drift. Now, we must remember that Mormon chose to include King Benjamin’s words because he knew they would be critical for our time. We often speak of the Nephite Disease — their cyclical trend of righteousness, selfishness, greed, and destruction. I wonder, what did Mormon see in our time to make this pattern such a dominant theme?